Protein with a Fruity Twist! Subject: Protein with a Fruity Twist! Come check out the new and improved Healthy Shot® from Hormel Health Labs. 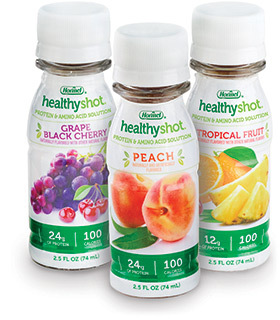 Healthy Shot features 24 grams of high quality protein in a 2.5 ounce serving. Available in 3 varieties including a 12 grams of protein option. Try the Peach, Grape Black Cherry or Tropical. This protein rich product is ideal for patients who need protein without the added volume.